"Where a little bit of luxury meets a lot of wilderness." The Kawishiwi Lodge grounds - adjoining the Boundary Waters Canoe Area Wilderness (BWCAW) in the Superior National Forest - offers a serene, peaceful, one-of-a-kind wilderness experience and allows you to be right on location for your trip departure the next morning or to have a cozy place to rest after staying overnight and tackling those portages. It’s getting harder & harder to get away from technology, so we are proud to offer accommodations - cabins on Lake One or bunkhouses - with no TVs, no radios, no phones & no clocks! Instead of ‘wired’ rooms, we offer tranquil views of nature from our cabin porches and docks. Your stay with us includes FREE day-use travel permits, which are required by the U.S. Forest Service before entering the BWCAW. Permits can be picked up at check in, no reservation necessary. 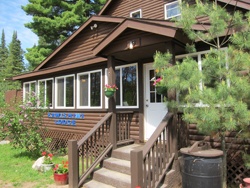 Kawishiwi Lodge cares about your health and the health of your family: all our accomodations are smoke-free; our cleaning staff uses environmentally-friendly EcoSense cleaning products; and we are happy to accomodate the needs of chemically-sensitive guests.